Catfish are raised in freshwater ponds of only four to six feet deep. Farm-raised catfish are taught to eat feed pellets that float on the water surface. Catfish are bottom-feeding wild. A catfish can put up to 4,000 eggs a year per pound of body weight. Small catfish are called "fry" as they still live on food supplied by the yolk sac. Smallest species of catfish (banjo catfish) is only 0.39 inches long. Largest species (Mekong catfish) can reach nearly 9 feet in length and 646 pounds of weight. Catfish can be silver, grey, white, tan, green or yellow colored, depending on the species. Catfish have large, flat head and elongated body. Entire body of catfish is covered with taste buds that can detect chemicals in the water and respond to touch. Greatest concentration of sensory organs is located on the whiskers, also known as barbels. Catfish develops up to 4 pairs of whiskers. Most species of catfish have smooth skin (without scales) covered with mucus. Some species of catfish are able to breathe through their skin. 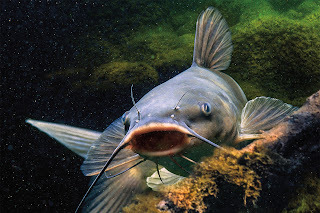 Catfish are able to produce and detect sounds thanks to Weberian apparatus (bony structure which connects swim bladder and auditory system). They produce sounds by rubbing together body parts or by inducing vibration of the swim bladder. Some species of catfish produce poison in the glands in the skin that covers dorsal fin. In the case of danger, catfish will release toxin that can induce serious (even fatal) injuries in humans. Asian walking catfish is a species of catfish that can move on the ground using its front fins and tail. This fish "walks" short distances when it needs to pass from one pool of water to another. Catfish can be active during the day (diurnal), night (nocturnal) or at the dusk and dawn (crepuscular), depending on the species. Catfish are carnivores (meat-eaters). Their diet is based mostly on fish, insects, worms, frogs and newts. Catfish are bottom dwellers (they feed on the bottom of the water). Cultivated species of catfish are trained to eat pellets that float on the surface of the water (against their natural instinct). Main predators of catfish are large fish, birds, reptiles, mammals and humans. Mating season of most catfish species takes place in the late spring and early summer. Female deposits large number of eggs (more than thousand in some species) in the crevices of rock, in dense vegetation or in some other dark place. Eggs hatch after 5 to 10 days. Father takes care of the eggs and young fish. Catfish can survive from 8 to 20 years in the wild, depending on the species. When the catfish reach 4 inches long are called "fry" (the size of an index finger). The catfish are harvested in the nets when they weigh about one to one and a half pounds. About 95% of farm-raised catfish in the nation stands in Mississippi, Arkansas, Alabama and Louisiana. Catfish is now the fifth most popular fish in America. Catfish is available throughout the year. More than 447 million pounds of catfish were produced in 1995.